The week opened with reports from the APEC Summit in Papua New Guinea that tensions were still strong between the US and China. Coupled with reports that Apple is cutting production orders for iPhones, the markets all went red in a big way. SPX was down 1.61%, NDX was down 3.23% and AAPL was down 3.96%. NKY and the European indices followed suit. Car maker EPA:RNO fell 8.4% on news of the chairman’s arrest. Currency moves were milder, with DXY giving up 0.26% with all currencies except AUD and NZD advancing. Gold was up in line with the weaker dollar. Oil and US 10-year bond yields were flat. The carnage continued on Tuesday, with SPX giving up another 1.8%., After gapping down 2.5%, and briefly erasing the whole year’s gains, NDX finished 1.75% down on the day. VIX made a new November high but then retreated. 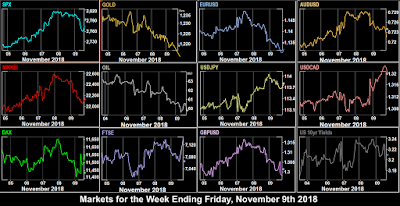 This was partly a continuation of Monday, but also a reaction to the huge 7% fall in the price of Oil as it broke through December 2017 resistance, and made a new 12-month low, on reports of a glut ahead from both the IEA and OPEC. 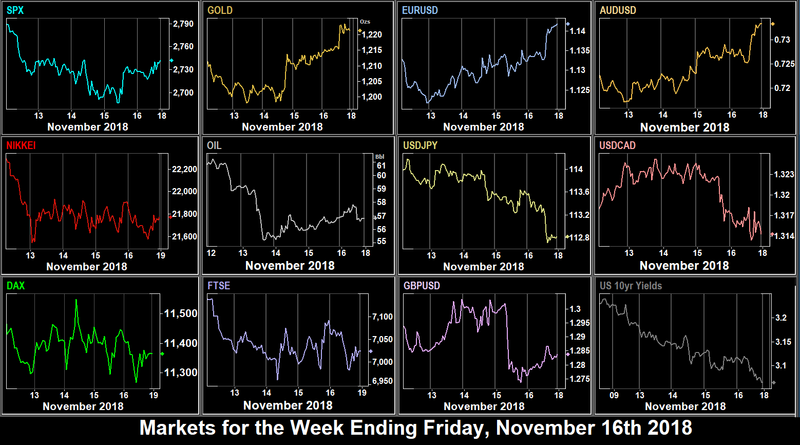 The dollar had a strong day in this risk-ff mood, adding 0.68% with all currencies firmly down, although as you would expect, JPY and Gold moved the least. Yields were slightly down as money flowed from stocks to bonds. There was a small dead cat bounce on Wednesday, with SPX up 0.3% and NDX up 0.9%. Other indices also rose, notably FTSE which added 1.78% on yesterday’s sharp fall in GBP and a 1.9% recovery in Oil. This was attributed to a withdrawal of Peter Navarro, a China hawk, from Trump’s team meeting President Xi at the G20 Summit next weekend, or the 14bp drop in BTP yields (despite Italy’s refusal to change their budget). 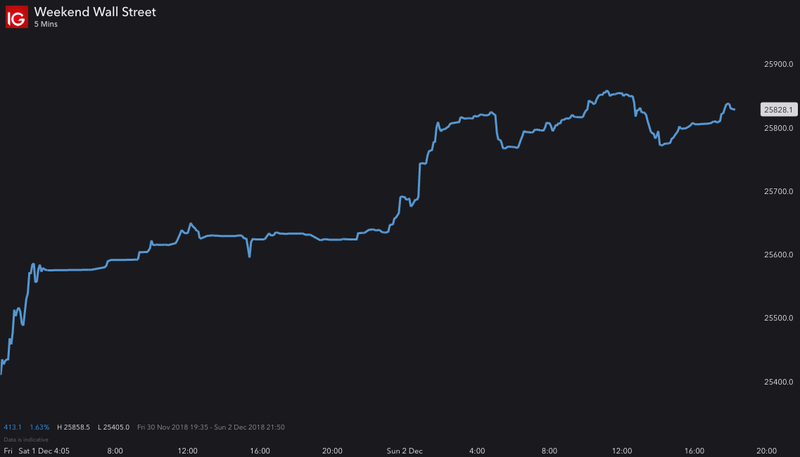 However, it was probably just a natural pause after the sharp two-day drop. The dollar basket dropped a mild 0.11% today, on vague reports that the Fed may pause its rate cycle next year. All currencies were up except JPY, which faded in line with the equity recovery, although Gold did not, adding $4 on the day. US yields were up 1bp, for the same reason as yesterday but in reverse. 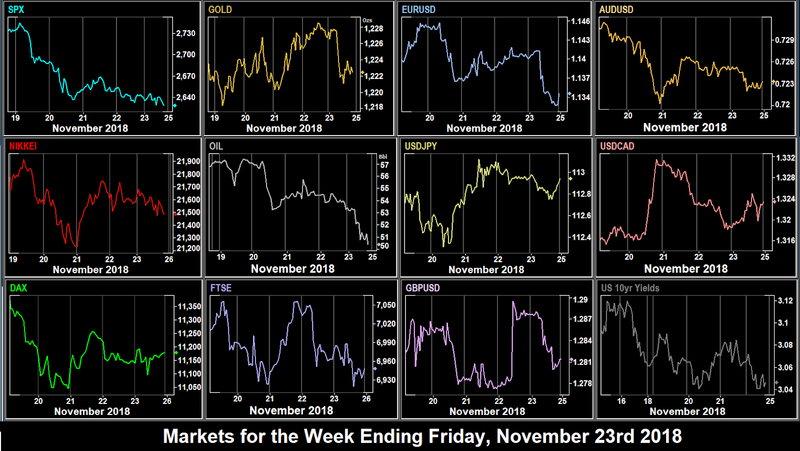 US Markets were closed for the Thanksgiving holiday, and as you would expect, volumes and thus volatility was sharply down. US futures and non-US markets resumed their downward trend, with notable sell-offs at the open in both London and Frankfurt, despite a further fall in BTP yields. NKY was down in the cash session, but managed to close flat at the end of futures trading. For once, the currency markets were more interesting, as sterling soared after thE UK and EU agreed a draft deal. GBPUSD was up 147 pips (1.15%) in the hour after the announcement at 0930. Also notable was ZAR, up 1.5% after the 25bp hike we predicted (against a hold consensus) last week. The GBP rise contributed to a 0.23% in DXY, but Gold and all other currencies (except, again, AUD and NZD) rose. Oil erased Wednesday’s small gain. The bond market was closed. The short trading day in the US (markets closed at 1pm EST) still resulted in a further 0.7% fall in SPX, and similar moves in other indices. Some reports are notable by their absence. AMZN reported that Black Friday sales were ‘already on pace’ to exceed last year ‘in terms of items ordered’, which is not saying more revenue (although later reports said that the day as a whole had beaten last year). The stock softened continually throughout the day, to close 0.97% lower. As Oil lost another 6.5% today to a 13-month low of $50.37 on continued oversupply (or under demand) worries, and Gold was also down, it was inevitable that many commentators said there was a Black Friday sale on all assets. USD had a good day out of all this, with DXY up 0.45%, as sterling gave up most of the previous day’s gains on concerns that the Brexit deal agreed with Brussels will not be passed by the UK parliament. EUR was also down for the same reason. In any event, all currencies (and Gold) moved south, except for JPY which did its usual thing, rising when stocks fall. Yields were down 2bp in line with the softer dollar. 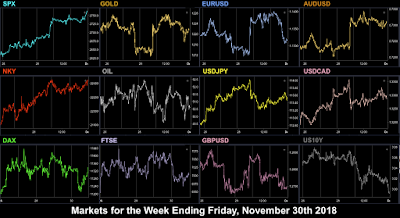 It was a solid week for USD with gains across the board, with NZDUSD the weakest pair. US indices were much weaker than elsewhere, with SPX, DJIA and NDX each giving up over 4%. But the real stories were Oil, which had its worst week since August 2014, and cryptos, which collapsed through support and plunged down. Yesterday was ECB, today is Fed. As well as new Fed vice-chair Clarida (2018/9 voter, centrist), we also have Bostic (dovish, 2018 voter), Evans (dove, 2019 voter), and George (hawk, 2019 voter) at 1930. There is a rate decision on KES. Data is relatively light. US GDP is probably the most important economic release of the week, along with the quarterly PCE, and inflation proxy. Both estimates are unchanged from last time. However, this data is too late to affect the Fed minutes out on Thursday. Of more interest is Fed Chair Powell’s speech on the Fed’s Framework for Monitoring Financial Stability at the Economic Club of New York. 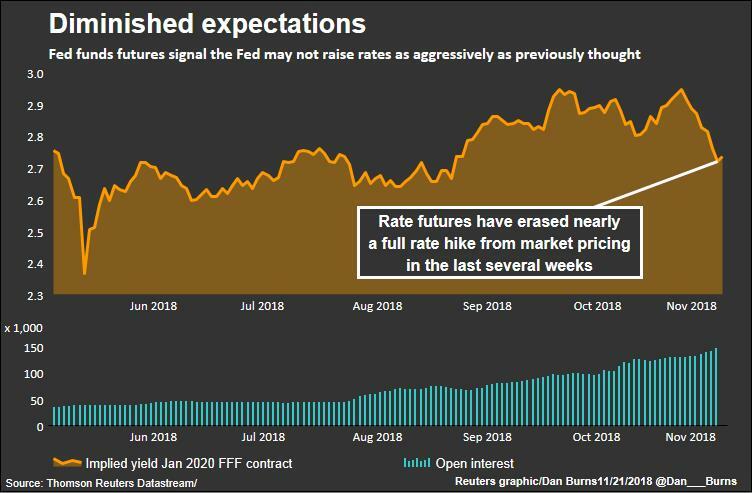 Today is FOMC minutes day (not a rate set meeting) and traders will be looking for confirmation that the December rate hike is still on, given the softening in economic data and of course the strong market pullback over the last couple of months. There is a clear gap between the Fed’s January 2020 rate projection (3.125%) and 2.75%, the rate implied by the Fed funds futures contract of that date. Other than that, a raft of data from Europe and the US should keep markets lively. The G20 Summit starts in Buenos Aires today and all eyes will be on the meeting between Presidents Trump and Xi, hoping that something positive on trade wars will emerge. Also Eurozone inflation if poor may further delay ECB tightening. It’s the final trading day of the month, so also expect additional volatility due to rotation. Monday saw two individual stocks fall hard, AAPL was down 5.04% on lower forecasts from its suppliers (implying lower iPhone sales) and GS was down 7.18% on their association with the 1MDB scandal. 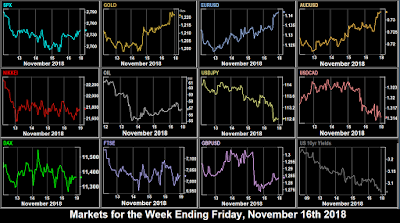 These stocks are heavyweights in the indices (the pair total 10.55% of DJIA), and the general sentiment, coupled with the lower volumes of Veterans Day dragged down all the indices. SPX was down 2%, NDX down 2.8%, and other indices followed suit. As often happens when equities fade, USD rises, and it was no difference today. DXY was up 0.7%, but flat against JPY, which also rose in the risk-off mood. All other currencies were down. Oil continued down, which weighed more on the FTSE than the weaker pound helped. Gold was down in line with the stronger dollar. The bond market was closed. Bond futures are traded, but they were flat. Another down day for US indices, although much less than Monday with SPX giving up 0.2%, and NDX was flat. The mood was more positive outside the US, with DAX and NKY rising, although FTSE stayed red again, weighed by Oil which had its worst day for four years, dropping 6.1%, on continuing worries about both oversupply and under demand. However, the large drop was a consequence of breaking through the February support low. In the last six weeks, Oil has given up a year’s gains. The reopening of the bond market saw a 5bp pullback, but DXY itself was relatively calm, falling 0.2%. Once again, the only currency to gain against the greenback was risk-off indicator JPY. Gold was flat at a round $1,200. Italian intransigence in their budget battle with the EU set a pessimistic tone for an already falling market, and SPX and NKY fell again, although it was more the financial and tech sectors which suffered, as energy stocks actually rose in line with the small bounce back in Oil, although 0.9% after a 6.1% drop is a very weak recovery. Italian yields continued to rise and DAX and FTSE were down in the cash sessions, although they recovered in futures to just about manage a green day. Markets were not helped by a string of important misses, German GDP, and UK and US CPI were all down against estimates. DXY was down 0.4%, with slight moves up across the currency board and Gold (which actually appreciated more than expected, up 0.75% to $1,211. Yields were down in line with the dollar. DXY was marginally (0.1%) up for the day, but this was purely due to GBP, all other currencies advanced against the dollar, as did Gold and yields were down in line. Notably CAD was up 0.48% on the day, Oil had another green day, if you can call it that, up 0.4%. NVDA reported after the bell, with an EPS beat but a miss on both earnings and guidance. One run and two strikes, and a 19% drop in price. WMT beat on all metrics, including slightly improved guidance. It didn’t help, after a gap up open, the shares faded all day to close 1.96% down. Analysts still think AMZN will crush them, keep an eye on WMT next Friday. Friday was a flatter day, with a slight recovery by SPX, up 0.2%, and a fade in NDX down 0.1%, to some extent driven by the NVDA results. DAX, NKY and FTSE were slightly down. DXY was notably down (0.67%), and the movement was even across the board, with every currency and Gold rising. 10-Year yields fell again, down 4bp to 3.07%. Oil was flat on the day. The dollar gave up last week’s gains, with DXY dropping 0.65%, and all currencies except Brexit-troubled GBP advancing. Shorting any GBP pair would have been good, the best was GBPNZD which dropped by over 3%. Indices had a bad week, with DAX down the most. NDX was only down 1.76%, but FANGs had a worse week, with AMZN the biggest loser. Also, after a few weeks of stability, cryptos had large losses again this week. As we move into Thanksgiving week, there is not much news, and no significant releases in the US. FOMC Williams (voter) speaks at 1545. We have three Bank of England speakers today, Governor Carney and also Haldane and Saunders. There are rate decisions on HUF and NGN, holds are expected. Today is the day when the EU are likely to reject Italy’s budget (as incompatible with EU deficit rules). This will ultimately lead to financial sanctions. This is probably priced in, but any last minute changes by Italy could affect EUR. Today is Thanksgiving and US markets are closed. However it is business as usual in the rest of the world, although there are no significant data releases. ECB Mersch speaks at 1700, and BuBa President Weidmann is also scheduled. There are rate decisions in Zambia and South Africa. A 25bp hike is expected for ZAR. Today is Black Friday, where retail stocks traditionally rise, as blowout selling is quickly reported (and nothing is said by those retailers which aren’t doing well). The key stock to watch for several years now has been AMZN. US markets close early at 1800 today, and Japanese markets are closed completely for Labor Thanksgiving Day. ECB De Guindos speaks at 1200. 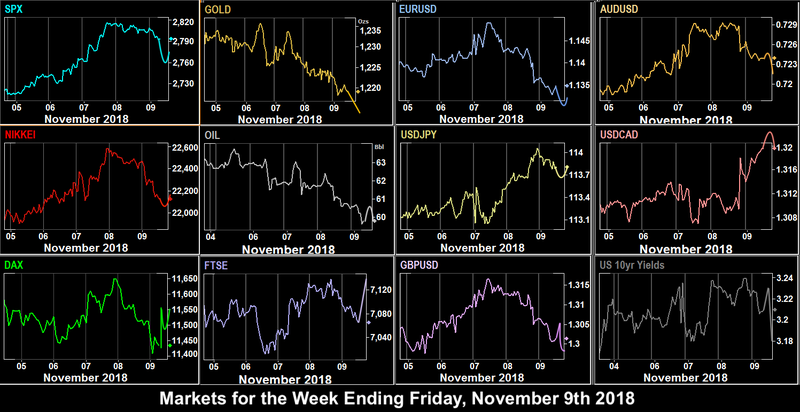 The mood was mixed in Monday, as the November upturn resumed to give SPX a 0.6% lift, but NDX turned down, still weighed by AAPL, after reports that production levels were static. The worlds largest company fell 2.84% in addition to its 6.7% drop on Friday. Italian yields rose again as Rome continued to defy Brussels on their budget, so it was no surprise that DAX was down, as was FTSE after the UK Market Services PMI miss at 09:30, and NKY finished flat on a slightly weaker yen. DXY continued last week’s downtrend, and gave up 0.3%, with EUR, GBP and AUD all advancing. 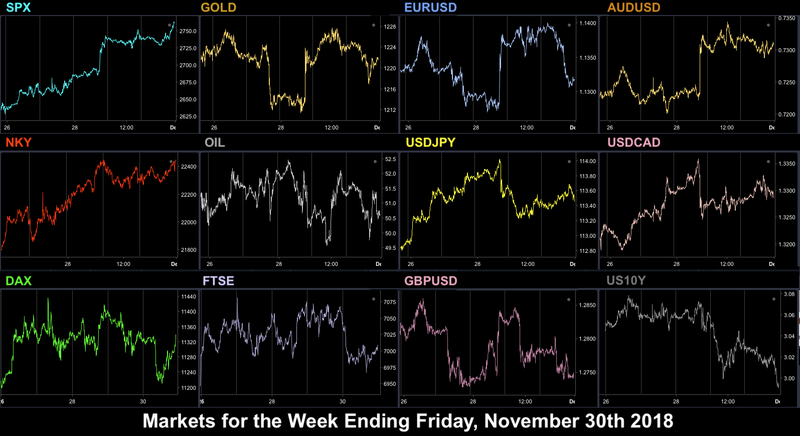 CAD was pulled back by WTI, and JPY and Gold continued their downward trend in line with the SPX gain. Yields were down 1bp in line with the weaker dollar. 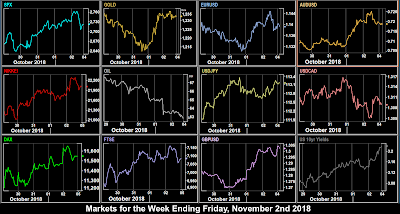 Markets diverged today with SPX, NDX and NKY firmly up as the mid-term vote took place, but a different story in Europe. Continued Italian budget concerns resulted BTP yields climbing 8bp, which pushed DAX into the red. Beats on the German, Spanish and Eurozone PMIs had no effect. FTSE was also down, but this was more a reaction to a notably stronger pound (up 0.4%), as nothing went wrong with Brexit today! 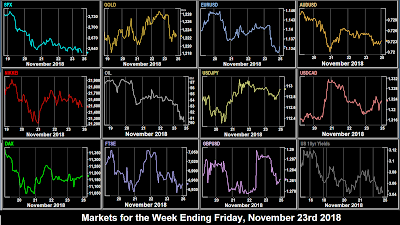 DXY had a virtually flat day (down 0.07%), with the GBP gain and a slight uptick in EUR balanced by a fade in JPY (and Gold) in line with the rising SPX. Notably VIX did not drop, suggesting some traders were hedging their bets on the election result. WTI continued to move down, losing 1.45% today, and CAD was down in line. Yields were up 2bp as the new paper auction at 18:00 sold at 3.209% yield. Markets love certainty, and they also loved the fact that no Democratic protest vote emerged. 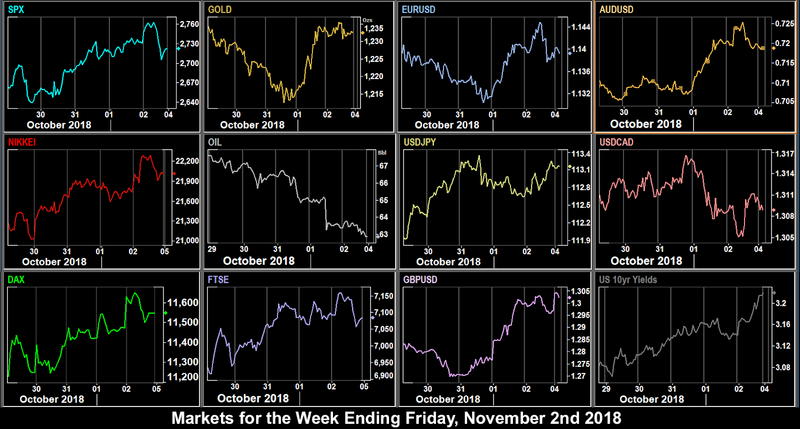 The midterms came in precisely as expected, and markets rose, with a clear risk-on sentiment. SPX added 2.1%, (riskier) NDX 2.7%, and VIX fell 17.8%. XLV outperformed on the belief that a gridlocked Congress would be unable to legislate way their profits, ie drug price controls. This was the seventh red day for Oil, the first time that has happened since January 2016. The fall is also because the US government has issued waivers to many countries to allow them to buy Iranian oil. Remember, like the dollar, the President has continually commented that he wants the Oil price lower. Yields had fallen as well in early trading, but tracked the dollar recovery and ended 1bp up. 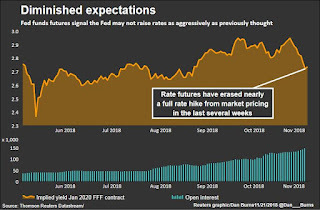 It was FOMC business as usual on Thursday, with the gradual rate hike path (and therefore resistance of White House pressure) confirmed again. This helped USD and depressed stocks, which took a breather after Wednesday’s strong performance, and SPX pulled back 0.3%. NDX was only down 0.61%. NKY, DAX and FTSE also registered small losses. DXY was up 0.46%, its best day for two weeks, and 0.31% of this came after the FOMC announcement. All currencies were down. Gold and bond prices (inverse to yields) were also down in line. Oil finished the day at 60.75, which is 20.98% from its Oct 3 high if 75.71, and so is now in ‘bear territory’ defined as a drop of over 20%. The continuing fall in oil prices, and other commodities, for example copper fell 4.84% this week, its worst since August was bound to eventually affect equities, and SPX fell 0.9% today. NDX, DJIA, NKY and the Oil-heavy FTSE also fell, whereas the resource buying (not selling) DAX managed a modest gain. Oil actually managed to stay flat, but closed the week under $60, the first time since February. The dollar continued to react to the hawkish Fed, as it often does the day afterwards. DXY added 0.28%, and all currencies and Gold evenly moved down against it. Yields however turned down 4bp, as equity money rotated into bonds. DXY added 0.42% this week, despite being down 0.85% at one point. The only currency that outperformed the greenback was NZD, after months in the doldrums. With CAD being depressed by Oil, buying NZDCAD would have been this week’s best forex trade, netting 2.39%. SPX benefited from the midterms and was the top index this week (DJIA did even better at 2.88%. NDX underperformed and as you can see FAANG performance was mixed. Once crazy in price swings, BTC and ETH continued for another week to show even less volatility than traditional instruments. It is Veterans Day in the US and Canada. Markets are not closed, but volume may be reduced, as also there are no release of note in either Europe or the US. Colombia markets are closed. Riksbank Sep Gov Flodén speaks at 1100 (SEK is 4.2% of DXY). Today is the deadline for Italy’s response to the rejection of its budget by the EU. Expect further defiance, and thus EU retaliation. Any pragmatism on Italy’s part would be unexpected and be positive for EUR and BTP prices. Today is the main release day of the week with inflation reports from both the UK and the US. Inflation is of course one of the Fed’s dual mandate items (the other being jobs), and unofficially, it is in the UK as well, so expect GBPUSD volatility. Although earnings season is largely over, IT giant CSCO, seventh-largest NDX component (2.7%) reports after the bell. Fed Quarles gives House Testimony at 1400. Fed Chair Powell and Fed Kaplan speak at 2305. There are rate decisions in Thailand and Israel. DJIA straggler WMT (2.7% of the index) reports before the bell today, and troubled giant NVDA (make of crypto-mining hardware, and 12th largest component of NDX at 1.7%) reports afterwards. Fed Quarles speaks again at 1500, and Fed uber-dove Kashkari is on at 2000. There is a rate decision in Mexico, and markets are closed in Brazil. A quiet day to finish the week. As we have said before, Eurozone CPI rarely moves EUR, as it rarely surprises as the individual 27 countries have already reported. Fed Evans speaks at 1630. Reports today that the US is considering tariffs on all Chinese goods not currently subjected to them depressed the US markets and SPX was down 0.7% and NDX down 1.6%. NKY followed suit as it often does. However, the situation in Europe was more optimistic, as DAX and FTSE were encouraged by Friday’s S&P rating on Italy, which was not as bad as feared, ad were up on the day. The MIB was up 1.9%. The BOVESPA in Brazil hit record highs after the election of right-wing President Bolsonaro. USD had a good day, with DXY up 0.38%. The move was across the board, with all currencies and Gold down. Oil was also down in line with the weaker dollar, and concern about China trade. 10-year yields were flat on the day. Earnings beat before the bell from MA, KO and PFE help shift the mood today, and indices recovered. Also important was a volte-face from Trump where he told Fox New that he expected a “great deal” with China. 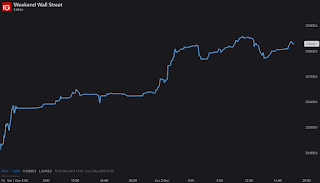 An interesting side-effect today was a very strong performance by the South Korean KOSPI, after the US government restricted certain semiconductor parts exports to China, with SK being the beneficiary. Samsung was up 3.8%. SPX added 1.6%, and all other indices followed. FB reported after the bell, and it is perhaps a sign of the softening mood that although it missed one metric (user growth) the stock did not plummet. After a brief spike down, it was firmly up in AH trading. DXY was up another 0.33% today, as EUR, GBP and JPY (83.1% of the basket) continued to fall. However AUD and CAD were up, the latter after bullish remarks from BoC Governor Poloz at 1930. Gold was down and yields were up in line with the dollar. Oil continued to fall for the same reasons as Monday. Markets were up again on the last day of the traditional summer cycle, where the theory goes that confidence switches from defensive to risk stocks. This effect could be seen as SPX rose 1.1% but the riskier NDX put on 2.31%, buoyed of course by FB which rose 3.8%, and was at one point 7% up. Nevertheless the month closed as the worst for equities since May 2010, with SPX down 7.83%, with an 11.03% intramonth low. DXY only added 0.12% today, but this was enough to beat the Aug 15th spike, and make a new 16-month high. EUR continued to fade on a mixed CPI report at 10:00, as did yesterday’s outperformers AUD and CAD. JPY advanced slightly, after two days of losses. GBP was ahead after UK Brexit minister said a Brexit deal is ‘in sight’. Gold was marginally down as was Oil again. However yields were up after ADP jobs beat at 12:15, on the expectation that strong jobs growth accelerates the rate hike path. President Trump today reported a “long and very good conversation” with President Xi. In addition to the new month and winter effects, this produced a third day of gains, with SPX up 1.1% and NDX 1.8%. European indices were likewise up, and only NKY was slightly down, pressured a reversal in JPY after two days of gains. However, the mood was spoilt by AAPL, the worlds largest company, when they reported after the bell. Although they beat on EPS and revenue, a lowering of forward guidance, and a decision to stop reporting iPhone unit sales (a key metric for investors) in future led to a 4% drop AH. It was a different story in currency. DXY pulled back sharply from the new high made on Wednesday, down 0.83%, its worst day in three months. The fundamental reason was firstly that the UK government announced that an agreement on financial services trade (dear to the hearts of traders) had been reached, which helped both EUR and GBP, and secondly, as part of the BoE Rate Decision (hold as expected) presser, Gov Carney said that rates would have to go up faster in the event of an orderly Brexit. It is a fact that the clearer the message, the stronger the reaction, and you can’t get much clearer than that. This of course now means that Brexit success or failure news will have an even larger effect on sterling. GBP ended up 2.1% on the day, its best day since Apr 18, 2017. EUR was ‘only’ up 0.85%, although it is notable that it was also at a support low from August. Of course DXY was at a resistance high from the same time. When technicals and fundamentals align, you get strong reactions, and there was a sharp move up in unconnected currencies AUD and CAD. Gold had its best day in three weeks, up 1.5% and yields were down, both in line with the weaker dollar. The pressure on Oil intensified, and the price collapsed through August and June support, dropping 3% in an hour in the US session, after Iran pointed out how many waivers the US had given to their Oil sanctions, and it was reported that OPEC output was the highest in two years. Oil is down 18% in the last four weeks, and October was its worst month since July 2016. The upbeat mood for the new month was dented by the AAPL news, and a refutation by Larry Kudlow, saying there is no new trade plan for China. Instead of welcoming the NFP beat (259k vs 190k, AHE/Unemployment as expected), the market saw it as “good news=bad news”, as explained in Wednesday above. This was confirmed by a noticeable spike up in both USDJPY and 10-year yields on the NFP print, the latter closing 7bp up, its best day since October 3rd, when the trigger was an exceptional PMI beat. These two factors pushed SPX down 0.6% and NDX down 1.2%. This was partly mathematical as AAPL is the largest component of both indices (SPX 4.4%, NDX 12.5%), but it was notable that AAPL had started to recover in the PM, only to fall again after NFP, and end the day 6.9% down. DAX and NKY, unaffected by AAPL were slightly up on the day. FTSE was slightly down, no doubt weighed by Oil which fell again to close its worst week since February. It was a quiet forex day, with DXY was slightly up, but evenly against all currencies and Gold. Both sides of the 49th parallel beat on NFP, but there was still a 47 pip (0.36%) spike up in USDCAD on the release. After the month closed as the worst for years, there was a clear turn-up in equities and downturn in the dollar, leaving DXY flat on the week. Risk-on currencies AUD and NZD (not part of DXY) were the best performers, and risk-off marker JPY was the worst. Buying NZDJPY would have netted you 3.08%. The strongest index rebound was NIFTY, and after many months of lower volatility, Oil made the largest move of all. The FANGS were mixed, a consequence of different reporting dates. Over the weekend President Trump meets President Putin in Paris. DST ends in the US, bringing it back into line with Europe. Today the US reimposes some tariffs on Iran. Eurozone finance ministers meet in Brussels. President Xi is scheduled to speak during the China International Import Expo and traders will be watching for any comment on the trade war. Also on today are BoJ Governor Kuroda, BoC Governor Poloz, and ECB Vice President Guindos. Russian markets are closed for Unity Day. Today are the US mid-term elections. The probability of the Republicans losing the House but retaining the Senate are both put at 85%. ECB Lautenschlaeger speaks at 12:00. One normally unimportant release, the Spanish Markit Services print at 08:15 is significant. The estimate is 51.8, the lowest for years, and a move below 50 (the point between expansion and contraction) could have a severe effect on the IBEX and Spanish bonds. Singapore is closed for the second day of Diwali. The mid-term polls close at 0100, and enough results should be in by 0500 to determine the composition of Congress. Expect a wild ride on ES and YM futures in the Asian session. It is expected that the US Section 232 report on the auto industry results will be announced, leading to further auto tariffs.ECB trade chief Cecilia Malmstrom speaks today in Brussels. Indian markets start a two day Diwali holiday for the third and final days of the religious festival. The FOMC rate set meeting is unusually on Thursday this month, rather than the usual Wednesday. A hold is expected, although surprisingly, there is a 7.2% chance (higher than usual) of a hike, per the CME FedWatch tool. The only significant (to indices) earnings report this week is DIS, after the bell. India is closed again. Somewhat quieter today, and markets will almost certainly still be reacting to the mid-terms and the Fed. The main release of the day is UK GDP at 09:30. Fed Quarles (centrist, 2018 and 2019 voter) speaks at 13:15 .